53rd Croatian Children's Film Festival | News | Best filmmakers are arriving to Rijeka! Best filmmakers are arriving to Rijeka! Tomorrow, Wednesday, September 30th, Rijeka will host over hundred and fifty of the best film makers. Even though film festivals are becoming more common, what makes this one different is the fact that those film makers haven't finished elementary school yet! 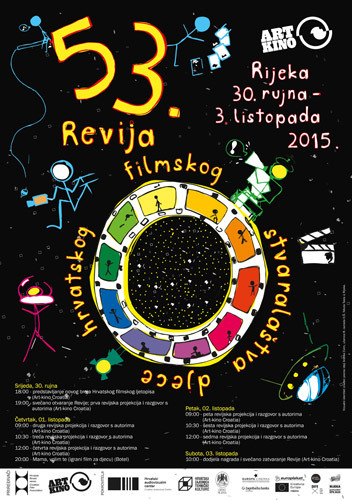 Rijeka is hosting 53rd Croatian Children's Film Festival. Starting on Wednesday, all to Saturday, October 3rd, Art-cinema Croatia will show the best film work by Croatian elementary school students. Out of 194 submitted films, 92 were selected for the official part of the festival. They will be judged by the „adult“jury as well as international children's jury. Children's jury has 30 members, fifteen of which are elementary school students from Rijeka and fifteen of them are best European filmmakers from Hungary, Macedonia, Slovenia and Serbia. Besides promoting their best work, participants will be able to take part in workshops, learning how to make a film with their cell phones, make a film in one shot, create their own optical toys and get many other useful skills and knowledge. Double issue of the Croatian Film Yearbook will be presented during the Festival as well. Croatian Film Association is investing in development of film art since the earliest ages for over half a century and this year's Festival is organized with the support of Croatian Audiovisual Center, Croatian Association of Technical Culture and the City of Rijeka. Partner in organization is Art-cinema Croatia from Rijeka and with their help, Festival came back to Rijeka after over three decades!